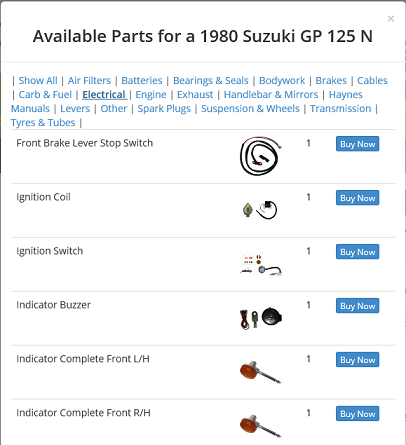 Increase your web sales by allowing your customers to use Part Finder on your website. Our easy to use plugin allows you to offer the power of Hi-Level Part Finder to your own website customers. With just 2 lines of code to add to your site it can be up and running in no time at all. As part of your subscription you get access to inventory data feeds and product images. Two lines of code - that's all you need to add to your website to get Part Finder available for your customers. You can also add Part Fitment data to your product detail pages - this part is suitable for these bikes. Because the Part Finder Plugin is hosted on our servers, whenever Hi-Level make a change to the data, the new information is immediately available on your site. No updates required at your side. So you can create all the Hi-Level products on your own website, we provide full data feeds containing all the product information, inventory position, and current trade pricing. You also get access to the full Hi-Level image library with no watermarks.